Venue: Taman Seri Empangan, Putrajaya. Address: Taman Seri Empangan, Lebuh Gemilang, Presint 5, Putrajaya, Wilayah Persekutuan Putrajaya. 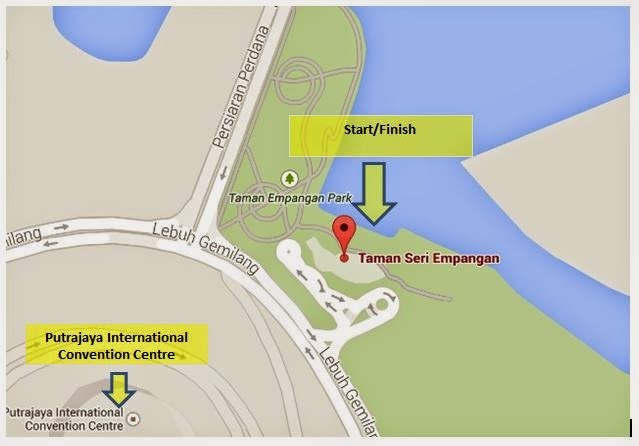 * The nearest building/landmark to Taman Seri Empangan is Putrajaya International Convention Centre (PICC). * Flag off will be in wave. Please be punctual. * You will need to declare your qualification during registration. It is a total road course. This event is open to all Malaysian/Permanent Resident and oversea runners age 18 years old and above only. It non-competitive format. There is no prize for this event. It is just a self-satisfaction to challenge and see your own limits. * Participant need to start and finish at Taman Seri Empangan. You will need to reach each check point base on your category and come back to finish venue. * Route can be change based on current condition and situation. * All item subject to availability, for lunch at CP5 (100 miles and 100KM), it in buffet and will be serve after 12PM on Saturday. It on first come first serve basis. It only for runner and pacer and not for your unofficial support crew. Additional for Muslim, we will provide prayer mat, sarong/telekung and slipper at each Check Point. * Subject to be change depends on the course condition and situation. Please remember the course is out and back, so you will reporting to the same check point twice. - Only for 100 miles categories. - Only 1 pacer’s bib will be release for each participant for above categories and allowed to access to all related support at each Check Point for free. - Pacer can start at any Check Point they desire as far you play your role to support your pace. - Mandatory item will be mandatory and we will DQ you if your pacer/support crew carry your mandatory item. - Do make sure your support crew not against the event requirement else you will be DQ. * not make any rubbish, collect your own. * transport you to any other check point. - They will be timing chip for this event. - Do help to make sure you check your timing chip at each Check Point. - Reach the finishing line more than cutoff time. You are still a finisher but your status will be displayed as DQ. We will only wait for you for the next one hour after the cutoff time. - Create any harm to other participant or organizer or come with disturbing behavior. - Not comply to mandatory item. Please help to inform the nearest Check Point if you want to DNF. They will be no transport to fetch you. You need to arrange your own transport. We will share all related contact number including taxi during the kit collection. - There will be a medical personal on standby at main Check Point. - 2 ambulance will be on standby for any emergency cases, one at starting point and one at 80KM mark. - Participant are responsible to ensure they are fit and healthy before start. - Participants are to accept the risk associated with the event as per indemnity clause as per registration form. - The organizer will not responsible for any claim resulted from this event. - It is recommended that you have personal accident insurance or health insurance. - Hydration bag/handheld bottle (sufficient to last at least 13KM). * Mandatory item should be in your bag at all time. We will randomly check those items at designated checkpoint. For any missing one of the item, it will result to disqualification or time penalty. * We will implement Bring Your Own Bottle (BYOB) concept. So please bring your own portable cup or mug or bottle. We will not provide any of those at each CP including start/finish line. - There is no road closure during this event. - Please avoid running on the main road if possible. - Pavement or pedestrian walk or any path along the side of the road should be used when available. - Use common sense when crossing the road or junction. Be alert of vehicles passing by. - Some section(s) might require runners to cross a main road, so runner’s alert is needed. - There will be a drop bag service at Start/Finish line. - Please help to pack your thing properly and tag with Name and Bib Number. - Please do your own self-packing/self-marking/self-deposit your drop bag. - We will dispose any drop bag that not collected 2 hours after the cutoff time. - We will not reliable for any damage to your item. - To withdraw your drop bag just show your bib number. - We allow special need bag at below Check Point only for each participant. - Please help to pack your thing properly and tag with Name, Bib Number and Checkpoints. Label with permanent, large and clear font. - Advise to use reasonable-sized and waterproof material for your bag. - To withdraw your drop bag, just show your bib number. - Please deposit your special need bag at least 1 hours before the flag off at the Start/Finish point and make sure you put the bag at the correct Checkpoint sign. We will not responsible for any confusion by putting the bag at wrong Checkpoint number. - All the bags are expected to reach the Start/Finish line 1 hours after the CP cutoff time. We not allow you to downgrade to lower distance during the event. Distance Markers will be placed at every 5km or where possible. - We welcome your family/friends to cheer & support you along the route & at the Checkpoints. - We will not provide any support/aid to any of your supporters/family members/relatives/unofficial pacers. - We will also not tolerate any rudeness from any supporter(s). Please respect the organizers, volunteers, contractors and any other parties involved in this event. - Please do not have any vehicle following you along the road as it will cause inconvenience to other motorists/vehicles/runners. We will not responsible for any traffic rules violated by your supporters. - Once you receive your entry confirmation we are not going to entertain for any cancellation. - Please bare in mind, as soon as your entry has been received there are a number of costs involved and your entry fee goes towards setting the event. Data change, Bib and T-Size. Data change only. No change on Bib, T-Size and category. There is charges of RM20 for each changes. Do email us using the confirmation slip that you get before and state the header with "BIB TRANSFER" or “CHANGE OF CATEGORY”. We are not going to entertain last minute request. Some of the details might be change depends on the venue sponsor requirement and current progress situation. If there is a change, we will share the latest update in the email and FB page. But for now above will be taken.